Over the summer, I was given 20-plus recipes to fill up a brand-new recipe book as part of a bridal shower, which is pretty much heaven for me. 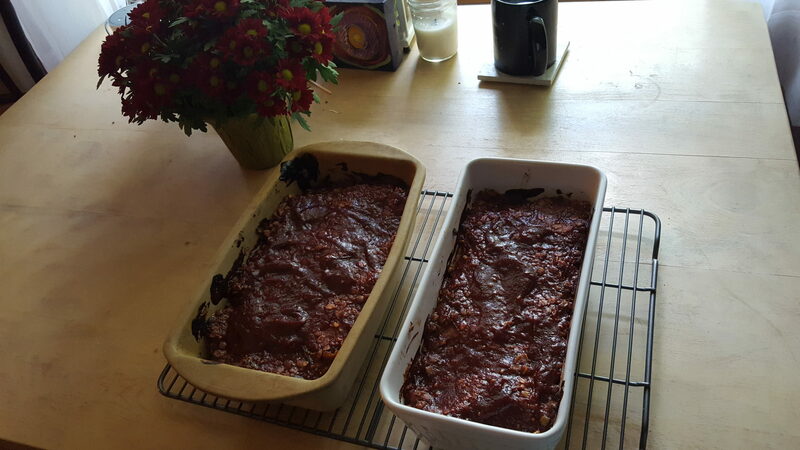 The one I knew I had to try first as part of my preparation for fall-is-coming excitement is a meatless meatloaf that uses butternut squash and lentils, two of my favorite things ever. I pretty much keep frozen butternut squash in my freezer year-round for my multitude of squash recipes. I had to do some digging to find where the giver of this particular recipe had found it, but it turns out that it came from Catching Seeds, which is a new site to me. It’s a delightful food blog geared towards vegans, and after this one I’m so excited to try out other recipes (including a certain chocolate beet donut recipe). This Vegan Butternut Squash Lentil Loaf is perfect for fall foodies. Here’s what you need for one loaf (I doubled it and made two). A few notes on the ingredients. Since I use frozen squash, it took about a bag and a half to get to three cups worth of squash. Flaxseed meal can usually be found in the baking aisles of the co-op; liquid aminos and white miso (powder) are both found in Asian food aisles, but if you won’t use the aminos often enough to warrant buying a whole bottle, tamari works superbly. Honey is not considered vegan for everyone, so if you’re concerned about that, I think agave would be an okay substitute. Additionally, as someone who really dislikes balsamic vinegar in general, I was worried about using it here, but it was really delicious! If you want to swap it out, however, apple cider vinegar would work just fine. I also don’t really like pepper, so I didn’t include it, and I also substituted olive oil for the avocado oil. 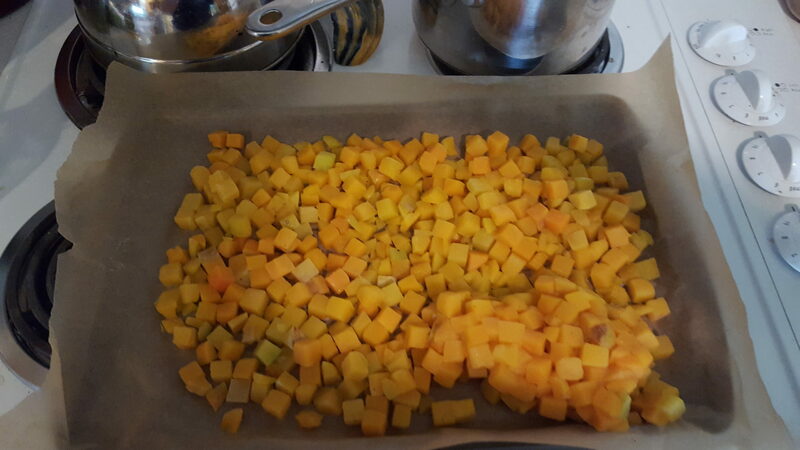 I took the squash, olive oil, and salt and placed it on a baking tray to be baked at 450 degrees for 20 minutes. While that was baking, I boiled the lentils; I used green lentils, which use a two-to-one ratio of water to lentils and simmer for about 20 minutes. I combined the flaxseed meal with 3 tablespoons of water (as the egg substitute) and set it aside to thicken while I sautéed the onion, celery, and garlic in coconut oil. As with any onion sautée, I added the spices after the pieces became translucent. When the lentils and squash were done, half of each went in a large bowl to be mashed using a potato masher. I mashed the mixture about five minutes or so just to be sure, since lentils are hard to mash. I then added everything else, including the last half of both lentils and squash, and thoroughly mixed. 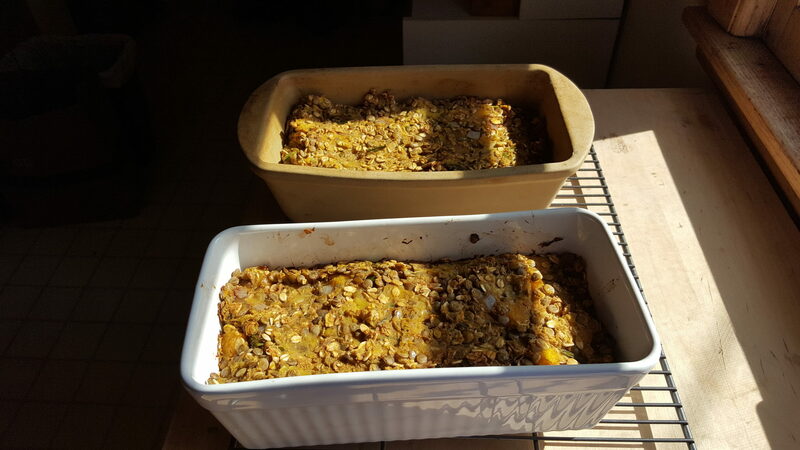 I used one brand-new loaf pan and one heirloom pan to hold the mixture and baked it at 350 degrees for 50 minutes. I brought the vinegar to a boil, and simmered for two minutes; after removing it from heat, I added the paste, honey, tamari, and spices to it and whisked gently. I brushed it on each loaf to thoroughly cover it and then baked it for another 20 minutes. I’d recommend eating this with an apple on the side and maybe a small side salad of your choice. However, I ate it with cherries and a golden-tofu tomato dish over rice. It’s very filling on its own as well. 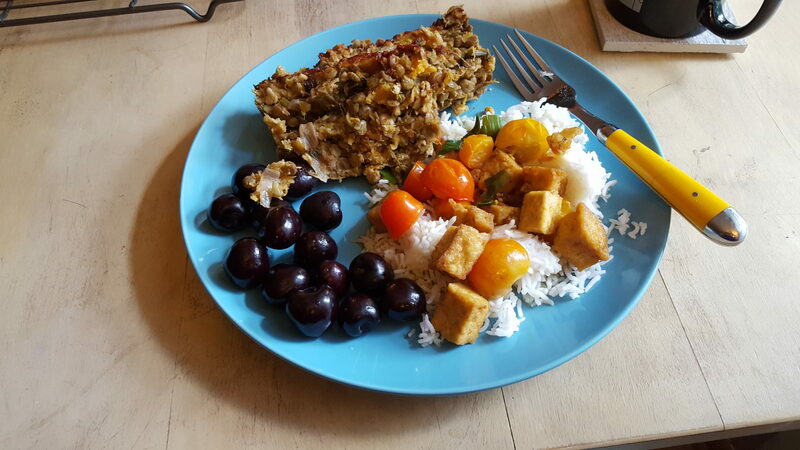 Two slices of meatloaf, cherries, and the tofu dish.